Spiders sometimes can be frightening little creatures! Spider bites are even scarier. They live in your home, your yard, the woods and many other places. Spiders are territorial and if you invade their space, they may bite. 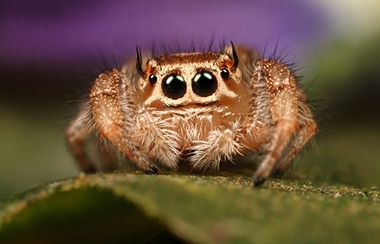 With eight legs and only two body parts, they may be small, but can deliver a potent bite. Some are poisonous, but some are not. The spiders whose bites are poisonous deliver venom via their fangs. This article contains helpful information on identifying spider bites and what to do. 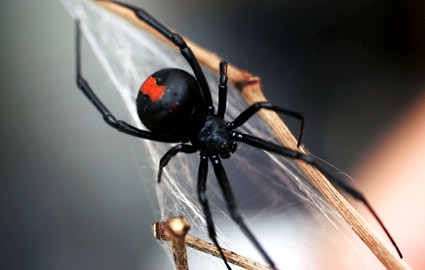 Black widow spiders are black with a red hourglass shape on its underside. They are found in the southeast and southwest. They like hiding in low dark spaces. You will find them in piles of wood, leaves, boxes and crevices in your home. Danger Level: They can be dangerous and fatal if untreated. Children need immediate treatment. There is anti-venom available, but is only used for severe emergencies. Symptoms: The initial bite feels like a pin prick. They leave two bite marks with pain to the area, redness and swelling. You may also experience some symptoms like headache, stomach cramps, tense muscles, weakness and sweating. This is known as the “violin” spider due to a violin mark. They are common in Texas, Missouri, Oklahoma, Kansas, Arkansas, and Louisiana. They are non-aggressive and only bite if they feel threatened. They like secluded dark areas. 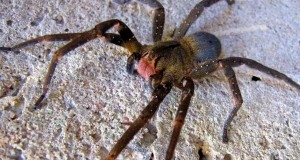 Danger Level: Bites can cause injured tissue to “die-off.” There is no anti-venom available for this spider at present, but treatment can help faster healing. Symptoms: The moment you’re bitten, you most likely won’t feel it. The bite then begins to itch, turns red and painful. You may notice a “bull's-eye” with red rings around a white center. Other symptoms may include headache, fever and chills. 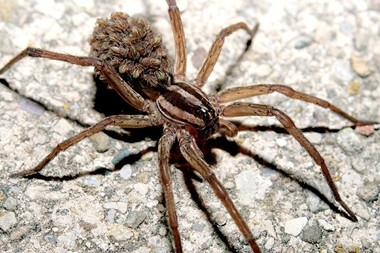 Hobo spiders are typically found in the Pacific Northwest. 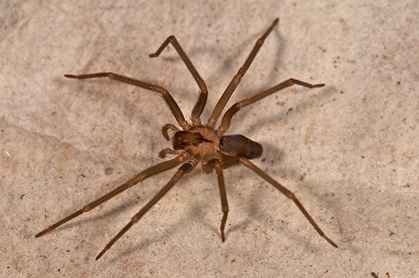 These long-legged spiders are found under or behind furniture, in dark closets and under baseboards. Danger Level: Hobo spiders can be aggressive and may attack you if provoked. They are not known to be fatal but some cases of tissue “die-off” like a brown recluse bite have reported. Symptoms: The bite usually is not felt until later. A reddish purple blister will appear, accompanying with nausea, vomiting, fever, headache, trouble breathing, rash or muscle pain. This is a common household spider found all over the United States. They are 1/2 inch long with a hairy fat body and black with white spots on the back. They walk erratically and jump. You can find them in your yard outside, near plants, and in the windows of your home. Danger Level: Jumping spiders do deliver a venom and the reaction is the same level as being stung by a wasp. They attack if they feel a threat. Symptoms: The bite is itching at the site, painful, swelling and red. There can be significant swelling. Wolf spiders inhabit most of the places in the United States. Their body size can be 3 to 4 inches. They have two large eyes right in the middle of the face with six smaller eyes that are not very noticeable. They live inside house plants, sand, gravel and baseboards near doors and windows. Danger Level: The most harm they cause is tissue damage at the site of their bite. These huge guys like to stalk prey, so watch out for them. Symptoms: The bite may tear skin with some initial swelling, pain and redness. Some people develop swelling in the lymph nodes. It can take about 10 days to heal. These spiders are most common in Central and South America. However, they have been seen in boxes of bananas that come to the United States. They are about 5 inches long, yellow and brown and are very quick movers. Danger Level: They are one of the most poisonous spiders in existence. Their bite can be fatal, but there is anti-venom to counteract. Symptoms: This bite delivers immediate severe pain, profuse sweating with heavy drooling. Call 911 or get to a hospital right away! Camel Spider – They have no venom but pack a bite which can cause a large wound. Tarantula – They are harmless to humans, but they look daunting. They are actually pretty docile spiders. They rarely bite and if they do, the bite will be felt like a bee sting. Huntsman Spider – They are pretty large but not dangerous. A bite will only cause some swelling and pain to the area. Get Immediate Medical Attention – You may need an anti-venom medication for black widow and Brazilian wandering spider bites. 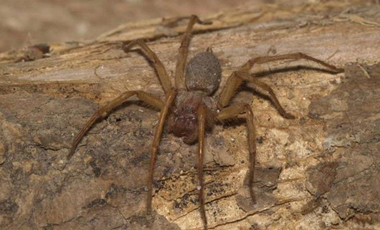 A brown recluse may require immediate antibiotic therapy to prevent tissue loss. Clean the area. Use an antibacterial soap and water to clean the bite area. Apply a mild antibiotic ointment. Elevate the affected limb. Whether the spider bites are on your leg, arm, foot or hand, tie a bandage above the spider bites and keep the limb elevated. Try not to use the limb to prevent the venom from spreading. Use an ice pack. Use an ice pack or a cold wet washcloth. Make sure the ice pack won't freeze the bite area. Do not use a tourniquet as this can further cause tissue injury! If you're experiencing the symptoms of severe pain, cramping in the abdomen, infection of spider bites or the bites do no heal, see a doctor immediately. Cover your skin and wear work gloves when working in wood piles, attics and gardening. Shake your work or garden gloves before wearing. Check boots and shoes if there is any spider. Use insect repellent when working outside. Spider-proof your home by sealing screens, windows and cracks to keep them out. Get rid of excess boxes and items in storage areas. Avoid the stored items touching the floor or walls. Keep wood and rock piles away from your house.